The Shetland sheepdog is not just a collie in miniature form, but rather its own breed that has been crossed extensively with the long-haired, or rough, collie. Together they, and other similar breeds, are collectively referred to as collie, but make no mistake; the Sheltie is its own dog that has had many distinct (and extinct) breeds have contributed to its genetic makeup. Placed in the herding group, Shelties in their modern form are more of a companion and show dog than working animal, however, they still retain many herding instincts and the intelligence associated with the group. It was developed from spitz-type dogs found on the islands of Shetland, which are northeast of England, and that were used for herding the smaller sheep and other livestock that developed there. The rough collie obviously played a large role in the conformation and appearance of the Sheltie, but in addition to it and the Shetland spitz dog, the King Charles spaniel, Pomeranian, possibly the border collie and the extinct Greenland yakki all played a role in the smaller body and disposition of the breed. The rough collie factors into the Shetland’s makeup with crosses taking place between the two breeds until the 1940s. This influence has had a dramatic effect on the appearance of Shelties. The AKC recognized three acceptable colors for Shelties – sable (ranging from golden through mahogany), black and blue merle – and should have less than 50 percent white in their coat. They also have a double coat – long, water-resistant outer guard hairs with a soft, insulating undercoat – that sheds in clumps twice a year. While Shelties share similar-colored coats with rough collies, they stand only 13- to 16-inches tall and weigh 16 to 20 pounds (as opposed rough collies who weight between 45 and 75 pounds and stand 22 to 26 inches). Lively, loyal and intelligent, Shelties possess a biddable disposition and eagerly learn new commands. Stanley Coren ranks them as the sixth most intelligent dog (out of 132 breeds tested) in his book The Intelligence of Dogs. Aloof when it comes to strangers, Shelties are vocal dogs that will bark and alert the household to their approach. While they aren’t used much as working dogs any longer, they still retain the herding instinct, which will manifest itself in the dogs herding small animal (even children). 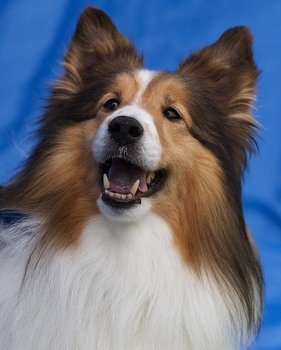 Shelties and their owners participate in sheepdog and herding trials and tests, agility, obedience, tracking and, of course, the conformation ring. Because of their high intelligence, regular exercise and mentally challenging activities are necessary to keep them happy and healthy. Without them, Shelties could develop undesirable behaviors and might find unhealthy ways to relieve the boredom, including barking, nervousness and chewing, among other things. Overall, Shelties are healthy dogs, but they do suffer from a few serious issues. Hip dysplasia is fairly uncommon in smaller dogs, but Shelties do suffer from it. Eye issues, urinary tract problems (including cancers), nervous system and blood disorders are among others. At Paw Print Genetics, we offer a breed-specific panel that screens for five known genetic mutations common in Shetland sheepdogs. Those include collie eye anomaly, degenerative myelopathy, gallbladder mucoceles, multidrug resistance 1 and the bleeding disorder known as Von Willebrand disease III (Group B). If you order the five-test Shetland sheepdog panel by Oct. 27, 2013, you can receive 15-percent off the cost of the test by entering the code “FBSSD” at checkout.